We import, train, and sell quality dressage horses. I especially enjoy the challenge and opportunity to find a client's dream horse. Various trips to our base in Europe are made, to locate and buy according to the pertinent needs and desires. Clients are encouraged to travel with me to Europe to truly appreciate what "horse shopping" over there is all about. There is the full advantage of someone who is truly familiar with Europe, who understands the client's needs and truly adheres to the fiduciary responsibility in a client relationship. This allows for simply enjoying the process of finding that special horse partner. Scroll down to our "current offerings" section to see some very special horses. "If you were to make a list of everything you need or want to find the right horse, it would describe what Rianne does. The first thing she did for me was to spend time talking to me until she really understood the horse I was looking for. Then she sent me several videos of horses and we went over each one and she wanted to know what I liked about each horse and what I didn’t like. Then she found the perfect horse. Rianne’s brilliance did not end there. She made all the arrangements for the pre-purchase, and importing the horse from the Netherlands to the US. She saw to every detail, even down to making sure the filly was on UlcerGard before the trip and that she shipped with fuzzies on her halter. In addition to taking good care of the horse Rianne took good care of me too. She was truly engaged and excited about the new horse and was a good friend throughout the entire process. I cannot wait to find my next one with Rianne’s help and can’t imagine doing it without her." This page will list some of the quality horses currently at our farm or horses that I have scouted in Europe. This list is by no means a total offering as I usually have a few other special finds on the back burner. I am working literally on a daily basis to find horses of superior quality, through contacts behind the scenes. My phone bill is a true testimony of this. This search is not an easy undertaking, because the prospective horse has to fulfill many criteria to make my list. If so desired, I can still take a client to the big, more commonly known horse brokers as well, but it has been my preference to find a "special one" that has not been discovered by everyone else yet. And what I do for myself, I like to have my client benefit from as well! Arrival at Dutch Dream Farm! Imported mare by Dancier (de Niro). Was Champion mare in Germany. Ultimate dressage partner, forward but sensible, not at all spooky and very sweet. 10 years old, Third level. Black with 4 white socks. Only for sale as owner's daughter off to college. 2. 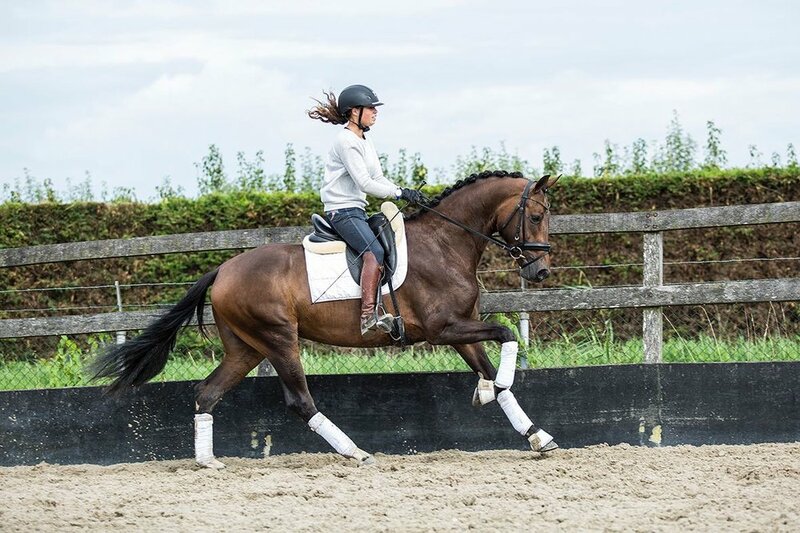 - SOLD- Phenomenal KWPN mare out of National KWPN Champion Dressage dam! This 3 year old mare is incredibly athletic and has gorgeous conformation. She is from champion bloodlines on both sides and will have the necessary "go" for the big arena. A special horse all the way around! 2018 picture of the mare I sourced as a 3 year old prospect. Still owned by the breeder! This phenomenal 7 year old mare, 17.2 hands tall, is by the stallion Vitalis, who has brought several top priced Elite Westfalian Auction mares in recent NordRheinWestfalen auctions ($250.000 and up). The recentWorld championships for 5 year old dressage horses was also won by a Vitalis mare, Victoria's Secret. And interestingly, all these Vitalis price toppers were chestnut mares! Here is your chance to buy a mare of this quality directly from the breeder. This is not the best video, but some phone footage from her mare performance test while the test rider is riding her. There is a funny story about this mare performance test. It was ridden with superb results, but things did not go as planned from the onset. However it shows the incredible ride-ability of this particular mare, as both riders during the mare performance test sat on the mare for the very first time. So not just the test rider from the NRW verband, but also the rider that normally is the regular rider of the horse. This was of course not planned, but it was the only way it was going to work that day. So an amateur rider, a 16 year old girl, nervous as heck, gets on the mare and rides her in the test to all 8's and 8.5's. All this happening far away from the mare's home, in a completely new environment for the mare! Below is a video of the mare a couple of years back, taken after I sourced her for someone looking for a spectacular dressage prospect. The picture above of the mare in the dressage competition, has been taken recently. She is still owned by the breeder, and now has won in various dressage competitions. This 8 year old 17 hand mare has won prestigious competitions already. She is at Prix St. George level and everything indicates that she has an incredible future in front of her. On top of her talent in the ring, she has been awarded the highest predicate a young mare can get, so she is a genetic gem as well for doing embryo transfers or a "second career" as a broodmare later in life. See video below. This four year old gorgeous mare is showing incredible balance for the short time she has been under saddle. She is 16.2, has a strikingly beautiful face and is of phenomenal quality all the way around. From a genetic perspective, she is descending from one of the most popular stallions of this time and is in movement a carbon copy of her dad. See below for video. 7. Gelding with champion lines on sire and dam side. Sire is Silbermond (by Sir Donnerhall I) and the Dam was Reserve Champion at the German National Elite Westphalian Championships as a 3 year old, and all the offspring out of the mare line are easy going, but forward horses. Superior ride-ability. His confirmation leaves not much to be desired and he has beautiful gates and is uphill under saddle as well. This gelding is about 16 hands and would be a great fit for someone wanting an elegant horse that can go places and win! (Please note that video is of this horse as a 3 year old, he is now a lot more advanced).